There is a frightening trend among my clients. 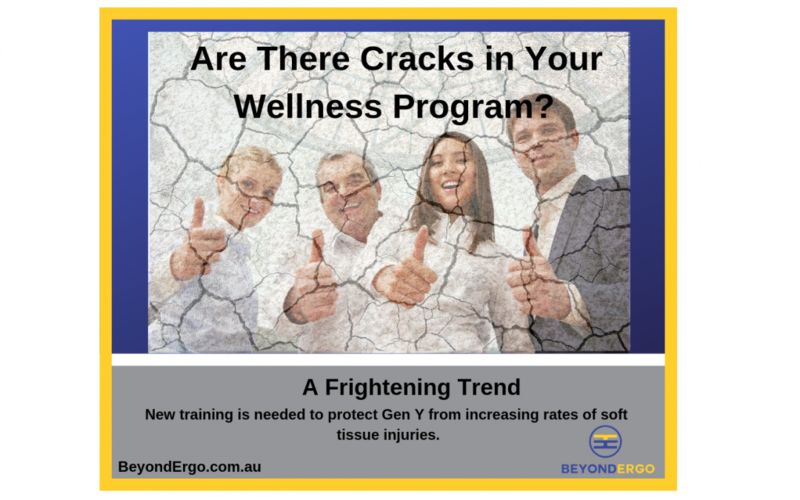 It reveals cracks in our current WHS and wellness programs. While we think employees in their 20’s as the least likely to get soft tissue injuries (tendonitis, chapel tunnel), these are exactly the group that concerns me the most. Why? Because we now know over 80% of employees in offices, experience aches, pains and musculoskeletal discomfort related to work and that Gen Y is entering the workforce already injured due to high levels of screen use. It’s time to re-imaging WHS programs and look holistically at wellness. Employers must provide training specifically designed to translate the latest ergonomics and self-care recommendations for office workers into work skills. That’s the Beyond Ergo training difference. We build programs that ensure employees gain knowledge and skills to make informed health and safety decisions. Programs that guarantee transfer, so self-care competencies are automatically applied in any work or leisure situation.